There are some short films which exist and cruise around the world entirely on their own terms; they are compact, self-contained entities which effortlessly bounce from one screen to another, touching audiences like that perfect little piece of snowflake falling on a nose. Tungrus is one such short film. After having travelled around 40 festivals worldwide, including Hot Docs and BFI London Film Festival, Tungrus had its latest screening at the Dharamshala International Film Festival last week. A charmed audience, who braved icy winds and showers to reach the venue, wondered about the eventual fate of a blustery rooster in the film. 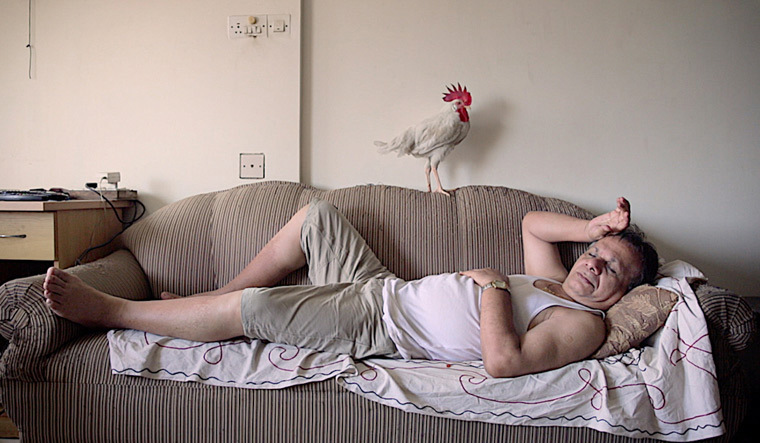 For in this 13-minute docu-short, Tungrus delightfully espies the haywire life of a middle-class, meat-eating family in a tiny Mumbai apartment after the ageing father in the household brings in a rooster to play with his cats named Ginger and Garlic. The rest of the family members reluctantly learn to make peace with the tumultuous ways of the chicken flapping all over the house. From constantly cleaning its poop, ducking, dodging and chasing its relentless march across the living room, to its mad crowing at ungodly hours, the grown kids wonder just how can a rooster add anything to a household. One calls the adopted chicken a "full-blown terror" in the house who does not let anyone stay in peace. There is a delicious bit of irony when the pet chicken relishes a meal of cooked chicken. The whole family learns to grapple with the rooster's presence for six months with the father somewhat optimistic that they can all co-exist. But eventually, patience runs out in an already strained atmosphere and the inevitable happens. The father, Mr Bharde, has to head straight to the slaughterhouse. While Mr Bharde does evince an interest in eating the meat of his former pet, the wife and the kids strictly demur. Does Mr Bharde actually eat it? The filmmaker, Rishi Chandna, is not exactly sure and does not want to ruminate on it much. "Mr Bharde comes from a village background, a rural setting where its very natural for people to grow up around animals and then consume them. It is just a clash of conditioning. But no, a chicken can't be domesticated by a meat-eating family in a 2bhk apartment in Santa Cruz. In a city like Mumbai, humans sharing space with each other is itself so difficult," says Chandna who shot the film for a week in the course of a month. In fact, Chandna met the family after they had already spent an eventful six months with the chicken and were deciding what to do with it. He heard about the curious case of the chicken from a friend who knew one of the hassled sons in the Bharde family. The short film is enlivened by Chandna's observational style interviews where the family members reveal their innermost thoughts about the chicken to much comedic effect. Recalling the shoot from last year, Chandna says that anticipating the chicken's moves was the most difficult part of framing the bird as a character. "It required a lot of patience since we did not want to stress out the bird with the presence of a film crew. I had long interviews with the family to understand his behavioural patterns because he had developed a distinct personality of his own," says Chandna of the royally mischievous and attention-seeking chicken trying to be part of the family. But the chicken is not called Tungrus in the film. In fact, the family doesn't give the pet chicken any name, both onscreen and off. They could never agree on a name. Initially Mr and Mrs Bharde would called the chicken "chiki, chiki", but then they soon stopped calling him anything. In the course of Chandna's extensive interviews with the family, Mr Bharde's wife tells the filmmaker that when her husband flies around the house trying to catch the chicken, the spectacle reminds her of Tungrus from Shyam Benegal’s 1983 classic Mandi. Chandna had to go back and watch the film to understand what she was referring to. In the critically acclaimed film, Shabana Azmi's character Rukmini Bai runs a lively brothel in the middle of a city. In one scene, when Om Puri enters the brothel's garden, Rukmini Bai calls out for her man friday Tungrus (played by Naseeruddin Shah) and alerts him. The way Tungrus catches and corners Om Puri in the garden, it was just like trying to catch a chicken. That's when Chandna decided to name this exuberant little short film Tungrus.